Description - A beautiful, crested, multicolored duck, the Wood Duck male is patterned in iridescent greens, purples and blues with a distinctive white chin patch and face stripes. 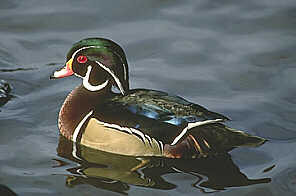 The female Wood Duck is greyish with a broad, white eye ring. The bill is mainly red and the tail long. The females call is louder than that of the male. Distribution - In the west the Wood Duck breeds from British Columbia south to California and winters near the Pacific coast no farther north than Washington. It inhabits wooded rivers, ponds and swamps and visits freshwater marshes in the late summer and fall. Biology - Wood Duck nests are lined with down in a natural tree cavity sometimes up to 50 feet off of the ground; 9-12 whitish or tan eggs incubate there. This surface feeding duck eats aquatic plants, seeds, grass, small aquatic animals and insects. Considered one of the most beautiful of North American waterfowl, Wood Ducks were hunted to near extinction in the late 19th and early 20th centuries. The hunting season was closed down and numbers rose steadily; there are well over a million Wood Ducks in North America.